With the release of hundreds of damaging documents, a dark side of Switzerland's democracy has been unveiled. Switzerland is now seen as a nation of greedy bankers, collaborators with the Nazis, and robbers of the wealth of the victims of the Holocaust. 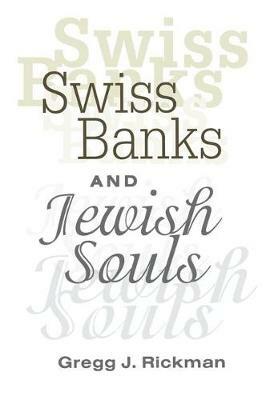 Swiss Banks and Jewish Souls is a powerfully enlightening account of how a small and determined group of people from divergent backgrounds humbled the legendary Swiss financial empire to achieve a measure of justice for Holocaust survivors and their heirs, while shattering the myth of Swiss wartime neutrality. Rickman tells how a small group of people, none of them professional historians, pieced together a puzzle of unknown proportions and proceeded to dismantle the myth of Swiss innocence and victimization at the hands of the Nazis, and expose a fifty-year cover-up. Untold numbers of European Jews and others placed their funds in Swiss banks because they believed they offered a safe haven for funds which the Nazis were trying to control. What better place to put their money than in Switzerland? Swiss Banks and Jewish Souls discusses how investigative groups proved that Switzerland stole the money of the Jews and helped the Nazis to do the same. No one began with evidence and no one had a source of knowledge upon which to fall back. All they shared was a feeling that something was terribly wrong and that a great injustice had occurred. Propelled by this instinct, a U.S. Senator, the World Jewish Congress, a British Parliamentarian, the U.S. Holocaust Memorial Museum, and a handful of Holocaust survivors accomplished what the U.S., British, and French governments and a group of feuding Jewish organizations could not or would not do. As a result of this effort, how the world views Switzerland and how Switzerland views itself has been redefined. Most importantly, those who survived the Nazi horrors, only to be victimized again by the Swiss bankers, have now achieved some measure of justice, or at least financial compensation after more than fifty years. "[Rickman] has written an indispensable insider's account of the confrontation between the Swiss banks and the alliance of D'Amato's banking committee and Jewish organizations. In the 1930s, many Jews placed their savings in Swiss banks, fearing the Nazi government would seize their assets. Many of those depositors were killed in the Holocaust... Between 1995 and 1998, D'Amato's banking committee pressured Swiss banks to make an equitable settlement with the Holocaust victims, which resulted in the historical agreement between the banks and the survivors... All levels." "The Richman book is at its best in its discussion of the various personalities involved in the controversy. The author coherently links the various events that made up the controversy, describing them in considerable depth, and focuses on the role of the D'Amato investigation in that development....It is an effective defense of the D'Amato effort, and has made the job of apologists for the Swiss Nazi-era record far more difficult."